Transportation systems are limited in the North. The NWT has only a rudimentary highway system. There’s a four, sometimes five, month navigation season on the Mackenzie River and four to five months in which Arctic waters are open to shipping. Unless a company is lucky enough to be developing a mine near one of those existing transportation routes, it will have to construct a winter road to its property. Besides flying, which is a costly proposition, it has no other way to move bulky, heavy equipment or the enormous quantities of fuel and other bulk supplies it needs. Once a company is committed to construction, April 1st often becomes the most important date on the calendar. It can’t count on ice roads holding up after that date, and if its heavy machinery, fuel and other bulk supplies aren’t on site by then, its schedule has been set back by a full year. Winter roads mean operating vehicles under severe winter conditions, often as cold as minus 40 degrees. A name synonymous with Northern ice roads is John Denison. He began building ice roads to northern mining projects in 1960 with Byers Transport. At that time the gold mines at Discovery and Tundra were looking for economical alternatives to expensive air transportation of supplies and equipment. 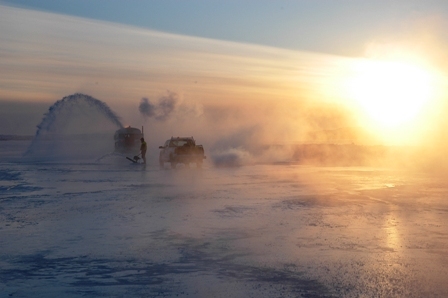 Denison and his road crew worked through the darkest, coldest days of winter building ice roads to some of the harshest and isolated Arctic regions in the world. Today, building ice roads is a high-tech adventure. With round penetrating radars and global positioning systems, builders can find the weak spots in ice roads much more quickly and accurately. This allows them not only to work in a more efficient manner, but also to build a safer ice road. 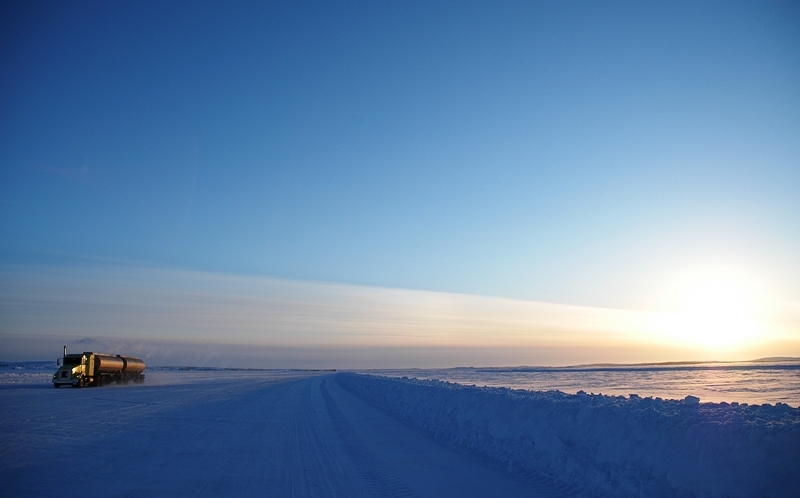 Ice roads are used today as the main supply route for the diamond mines of the Northwest Territories and Nunavut. Fuel, tires, construction equipment and more are shipped along the frozen lakes during a short ten-week window each winter.